In the summer of 2001 I had the opportunity to visit the various holy shrines and historic sites of Ephesus with my wife Maria. For centuries pilgrims have made this pilgrimage to one of the richest historic sites of Christianity. 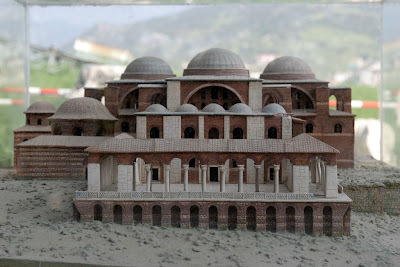 Ephesus is most noted for the marvelous Basilika of Saint John the Apostle which was erected in the sixth century by Emperor Justinian over the tomb of the Apostle. 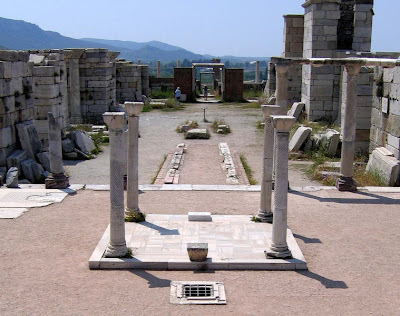 However, there are also holy shrines associated with the Virgin Mary who also stayed for a time in Ephesus, as well as the Seven Sleepers of Ephesus, the missionary journey of the Apostle Paul, and the Third Ecumenical Synod all took place here among many other things. In time I hope to cover my visit to all these places, but here I would like to concentrate on my arrival in Ephesus and the journey I made to the tomb of Saint John the Theologian. Along with this, I would like to offer some travel tips and warnings to make your trip more enjoyable than mine was. Maria and I arrived in Ephesus via the Greek island of Samos by ferry. This was the first time either of us ever visited Turkey and a majority Muslim nation, so from the beginning we were a bit nervous (keep in mind this was less than a couple of months before 9/11). While on the ferry a young man approached us and solicited us to stay at a hotel owned by a friend of his just a short walk away from the harbor. Since we had no hotel for the night and planned on staying near the harbor anyway, we took him up on his offer. In our gut, we both kind of knew that we may be making a mistake. When we arrived at the port of Kusadasi (Ephesus), both of us for the first time experienced culture shock to a certain extent. Even though Kusadasi is a resort town, it had a very different vibe compared to America and Europe. Maybe it just all had to do with the stories about Turkey growing up Greek, and a certain fear as to what may happen to me. As the young man lead us to the hotel up a long busy street on a hill, it appeared that many locals knew the young gentleman leading us. One person selling Turkish carpets hissed at us and with a creepy smile said: "Ah, you go to hotel so and so, huh?" Another from the other side of the street would say with a laugh: "You will like hotel so and so." And on it went until we arrived at the hotel. The only thing we thought about was what we were getting ourselves into. My biggest fear at the time was Maria. I had known about the dangers of human trafficking and how Turkey was the hotbed of stealing women and forcing them into prostitution following the demise of the Soviet Union. Of course, I never told her about this so she wouldn't be paranoid, but within fifteen minutes of arriving in Turkey I realized I may have to deal with some dangerous stuff. When we arrived at our hotel we were surprised to be welcomed by a bunch of fairly young guys that owned and ran the hotel, among whom was a blonde surfer-looking dude who greeted us promising us a great time. He told us our rooms would be ready in a few minutes and asked us to enter an empty room that looked like a small private Turkish coffee shop. He offered to get us drinks as we waited, but we were way too creeped out by this time and wondered if we accepted his offer whether or not the drinks would be spiked with something. We accepted nonetheless. When he got back with soft drinks, we got into a conversation with this blonde-surfer looking dude to find out what was really going on. He informed us that he was from Australia, yet two years earlier travelled to Kusadasi on a vacation and had such a good time here that he decided to move here and never returned to Australia. We informed him in a polite way that we were a bit creeped out by all the gesturing and remarks we got on our walk to the hotel and by the over-excited reactions we got when we arrived. His response was very polite and he informed us that we had nothing to worry about and apologized if they came off to strong. Then he told us how at night the place we were sitting in puts on a great party every night with belly dancers and loud music which we were welcomed to join. With his explanation we were more at ease and wondered whether or not we overreacted. About this time another American couple had arrived and they we were brought to sit in the room with us and they also were a bit creeped out, so we knew we weren't alone. They finally brought us to our rooms and everything was surprisingly nice and no one ever bothered us again. However I could not help thinking of that scene from Indiana Jones and the Temple of Doom when Indiana and his female friend were staying in rooms at a palace in India and at night men snuck into their rooms to kill them in their sleep. Culture shock sometimes could bring up the craziest images. Which leads me to my first warning when travelling to Ephesus - be better planned on your accomadations and try not to accept solicitations. About two miles from Kusadasi is the Basilika of Saint John. To get there we travelled by bus and it was already sort of late in the afternoon. In fact, the Basilika was closed but still access was available. This leads me to my second warning - make sure you check the time when historic sites are open to the public. I was very excited to finally see the Basilika of Saint John having read about it numerous times and once heard an excellent lecture on the history and architecture of this magnificent Basilika in my Byzantine History class taught by Dr. Nicholas Constas. In its day this was one of the great man-made wonders of the world. Unfortunately in 1330 it was converted into a mosque, then in 1402 the Mongol army completely destroyed it. Today it has been partially restored so visitors can understand the size and scale of this visual wonder. In fact, if it were to be fully restored today as a Basilika, it would be the seventh largest church in the world. When Maria and I arrived at the Basilika with other tourists, immediately we were singled out and greeted by an older man who did not speak English but asked us to follow him. He lead us to a secret area of the church behind what was once the altar area and kicked away some dirt from an area he obviously kept covered up. Under the dirt were some impressive original mosaics from the ancient church, very small in size and imageless. We thought this was interesting and thanked him. As we were walking out to go view the rest of the structure and the tomb area, he followed us and began demanding us for some money in return for him showing us the mosaics. He also offered us to buy some fake Roman coins with the bust of Emperor Justinian that he tried to convince us were real. It was then that we realized we were dealing with a gypsy. Because we had not yet converted our travellers checks to Turkish lira, we told him to leave us alone because we had no money. This was a mistake because after this he sent a bunch of children to harass us. As I was trying to absorb the environment and atmosphere of this holy shrine and take some photos, they would not leave us alone. Finally I called over the older gypsy and told him to give me one of his fake coins for five American dollars. He took it, but the kids wanted more money. Knowing we were not going to get any peace, we decided to leave and catch the bus back into town. It was a frustrating first day indeed. These frustrations followed us throughout our two week journey in Turkey. Which leads me to lesson number three - be absolutely sure to never deal with any gypsies in Turkey. Besides all the negatives, the Basilika itself was amazing. 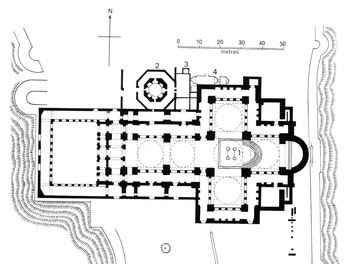 Originally it had been in a cruciform shape with six massive domes. More recently they have uncovered a baptistry and and a small chapel to the side. 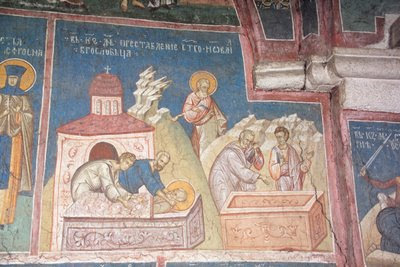 The tomb of the Apostle is today exposed to the elements, but originally it was located under the main central dome of the church. Unfortunately three relics which were still in the church during Ottoman times are now lost to us - a piece of the True Cross worn by the Apostle John around his neck, a garment of the Apostle made by the Theotokos, and most significantly for biblical scholarship today was the original manuscript of the Apocalypse which was authored by this apostle. When the Apostle John was over one hundred years old, he took seven of his disciples, went outside the town of Ephesus and ordered them to dig a grave in the form of a Cross. After that, John went down into this grave and was buried. Later on, when the faithful opened John's grave, they did not find his body. Tradition holds that he, like the Virgin Mary, was among the first to be raised from the dead. Each year for about a thousand years from the grave of the holy Apostle John on May 8th there came forth a fine ash-dust, which believers called "manna", and gathered it up after an all-night vigil and were healed of sicknesses by it. Therefore the Church celebrates the memory of the Apostle John the Theologian still on May 8 to commemorate this miracle, even though his main feast is on September 26. Many pilgrims of medieval times make note of this extraordinary miracle. Both Augustine and Gregory of Tours make reference to this annual miracle. Anglo-Saxon Willibald, later a bishop and a Saint, visited Ephesus in 724 and marvelled at the miracle of the manna that bubbled from the tomb of the Apostle. Symeon Metaphrastes in the tenth century writes of the festival on May 8th being of such great magnitude that it seemed there were more people in attendance to take part in the miracle and receive a portion of its distribution than there were stars in the sky. "On Saint Stephen’s day, every year, at the hour of Vespers, there comes out of the tomb (which is four-cornered and stands at the foot of the altar and has a beautiful marble slab on the top, full twelve palms long and five broad) and in the middle of the slab there are nine very small holes, and out of these holes, as vespers are being sung on St. Stephen’s day (on which day the Vespers are of St. John), manna like sand comes out of each hole and rises a full palm high from the slab, as a jet of water rises up. And this manna issues out . . . and it lasts all night and then all Saint John’s day until sunset. There is so much of this manna, by the time the sun has set and it has ceased to issue out, that, altogether, there are of it full three cuarteras of Barcelona [about 120 quarts]. And this manna is marvelously good for many things; for instance he who drinks it when he feels fever coming on will never have fever again. Also, if a lady is in travail and cannot bring forth, if she drinks it with water or with wine, she will be delivered at once. And again, if there is a storm at sea and some of the manna is thrown in the sea three times in the name of the Holy Trinity and Our Lady Saint Mary and the Blessed Saint John the Evangelist, at once the storm ceases. And again, he who suffers from gall stones, and drinks it in the said names, recovers at once. And some of this manna is given to all pilgrims who come there; but it only appears once a year."